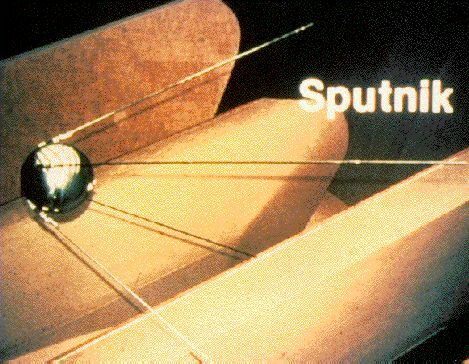 Explanation: Sputnik means "traveling companion". Despite the innocuous sounding name, the launch of the Earth's first "artificial moon", Sputnik 1, by the Soviets on October 4, 1957 shocked the free world, setting in motion events which resulted in the creation of NASA and the race to the Moon. Sputnik 1 was a 184 pound, 22 inch diameter sphere with four whip antennas connected to battery powered transmitters. The transmitters broadcast a continuous "beeping" signal to an astounded earthbound audience for 23 days. A short month later, on November 3, the Soviets followed this success by launching a dog into orbit aboard Sputnik 2.